Mike may have cracked the testing pitch, the harsh reason the Junior Developer is dying & a nice batch of audience questions and follow up. 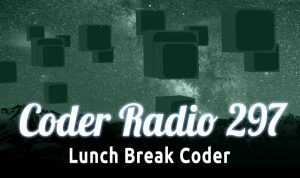 This week’s Coder Radio is just like mom’s cookin’, but with a taste of Kotlin. It’s not just a sign that an individual company is broken, it’s a sign the entire industry is broken.